Let’s start with this: WHY is it an 8:00pm kickoff? I mean, I prefer night games, but by the time we got out of there, it was literally a different day. You want to keep people in seats and from changing the channel? How about not making it end close to 3:00am on the East Coast?! I guess it isn’t as bad as the Hawaii-Colorado 10:00pm start time, but that’s like saying mice have it better than rats. Well, let me tell you, when the landlady is chasing you down with raid and a giant broomstick, you would probably wouldn’t feel the difference. No, it’s not a firsthand experience. Once you get over the late start, you might ask “Why is USC playing a relatively unknown school like Arkansas State?” Well, you know how Texas A&M beat down Arizona State the past week? It should’ve been USC beating down Texas A&M, but they decided not go through with the scheduling. Perhaps it’s to preserve their now 15-0 (now 16-0, after beaint ASU) record against non-conference opponents since joining the Southeastern Conference. Trying to find a last minute replacement, especially one that does not dip into the FCS realm, not exactly easy. And while Arkansas State is a Sun Belt team, their four year record is about the same as USC’s. They aren’t as big of a cupcake as most people think they are. Yeah, yeah they are trending downwards and USC wrecked them…but leave the CommBro Breakers™ up to me, alright? Just read the damn chart. Now that I’m done complaining about logistics and losing sleep, and you’re done griping about the competition, I can talk about the actual game. Spoiler alert, the final score was 55-6. Not a bad score line, but 55 isn’t exactly typical. USC had to fail a PAT to get there. But it all works out because it pays homage to the former 55 club linebacker, Keith Rivers, that led the Trojans out of the tunnel. Maybe they let it get blocked on purpose. Yeah, probably not. I would consider that fairly disciplined for the first game of the season and Pac-12 refs that are usually itching to chuck some yellow pieces of cloth. There were also no gaffes with the constant substitutions. These are all good signs. The most costly was probably the delay of game penalty. It quickly changed their plan from going for it on 4th down to punting. You can’t do that against stiffer competition. Running quarterbacks are still a problem for USC. Defensive ends and outside linebackers have not been up to par with setting the edge. Arkansas State quarerback, Fredi Knighten, managed to break a few longer runs for first downs. Luckily, they were only able to score once. On the other side of the ball, the offense had a decent showing. However, they still needed to punt six times and went 0-1 on 4th down conversions in 14 meaningful drives. There has been a lot of chatter about the unexpected allowance of 5 sacks. People will be quick to blame the offensive line and new coach Bob Connelly, but I’m not going to focus on that. One game is too small of a sample size. One thing that should be noted was that the four sacks came in the first half (two in USC’s second drive of the game). There was only one sack in the second half. Perhaps with Clay Helton calling the plays, Sark was able to work with Connelly and the rest of the offense to make some worthwhile adjustments. Tre Madden’s big run in the 2nd quarter was from a power formation. The combination of a great block by the fullback, Jahleel Pinner, and downfield blocks by the offensive linemen and receivers allowed Madden to take it to the house. Good to see that formations utilizing fullbacks are still a thing. 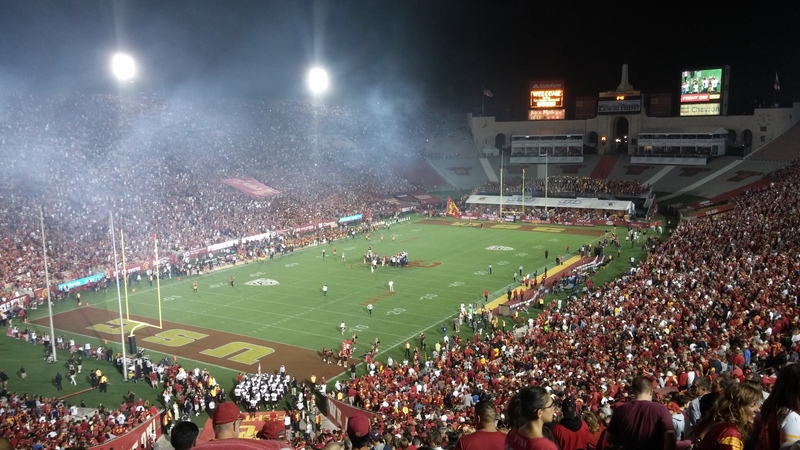 USC has not been great at beating the betting spread since the sanctions. This time, they beat it by almost double. I wish I could write about a lot more from this game, but unfortunately, I am out of time. It’s already Wednesday night and I’m just barely finishing up. Let’s be honest, most of you probably didn’t even read the whole thing or skimmed it. It’s only the first game of the season anyway. Trends will reveal itself and more interesting things will happen.